I can't believe that summer is almost over. We've had beautiful weather in the Bay Area all summer long with temperatures hovering around 75-80 degrees with sunny skies. There have only been about five days where the temps exceeded 90 degrees and today was one of those days. So since it was hot today, I didn't want to want to spend a lot of time in the kitchen cooking and so this dish was quick and easy. Also, this is a great dish if you want to use up end of season produce in your garden, especially zucchini and tomatoes. Note: If you have an outdoor grill or grill pan you should slice your vegetables instead of chopping and then chop after grilling. I don't have a grill and so I used my broiler and chopped the vegetables before roasting. Bring a large pot of salted water to a rapid boil and add whole wheat spaghetti and cook until al dente. When finished rinse under cool water and set aside in a strainer. Pre-heat broiler to 450-500 degrees and toss the zucchini in 1 tsp thyme, a drizzle of olive oil, and salt and pepper and roast on a sheet tray for about 10 minutes until lightly charred. Do the same with the cherry tomatoes. You want the vegetables to char and blister, but you still want them to be crisp tender. Remove from oven and set aside. In a large saute pan, add 1 tbsp extra virgin olive oil, minced garlic and vegetable stock. Reduce vegetable stock by half and then stir in nutritional yeast and cook for about a minute or so until yeast is dissolved and creamy. 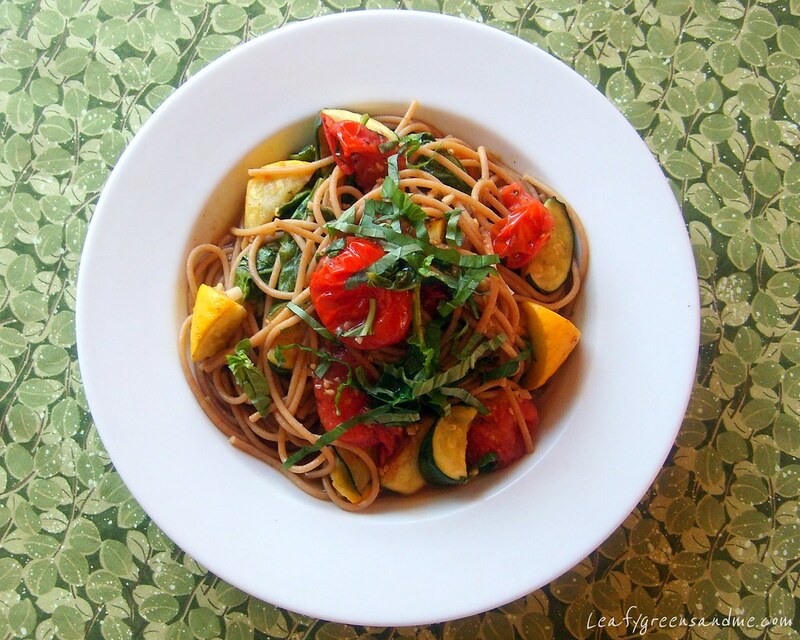 Add roasted vegetables, cooked pasta, spinach and toss ingredients together and heat through. Add chopped fresh basil, toss and season with salt and pepper to taste and fresh lemon juice.